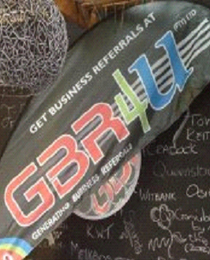 GBR4U (Pty) Ltd is a business referral networking group with our logo being: "We Help GROW Your Business" with Valuable Business Referrals. This also explains our primary aim within the local business market. We are a proud South African Registered Company - Reg. No. 2013/009752/07. Registered in terms of the Companies Act 71 of 2008 and Companies Amendment Bill 40 of 2010 on 23/01/2013. Being a true South African initiative, established in East London, we believe in "Local is Lekker". Due to the success of our first Virtual Business Mall, Pioneer 1, a high demand for prospective members led to the growth of subsequent groups Pioneer 2, 3, 4 in East London and Pioneer 5 in Port Elizabeth truly a South African Company based in the Eastern Cape. Being serious about our local economy and the growth of local business we became members of Border-Kei Chamber of Business. We are extremely proud and honoured to be member. Pioneers use the age old system of Word of Mouth Marketing to promote fellow members business. Word of Mouth Advertising is one of the most cost-effective types of advertising a business can have! This is directly due to the fact that People Trust People, making it one of the most Powerful Advertising tools that exists. Get People to talk about you and your business, it's free advertising! Ask yourself, Does your business have people who are willing to talk about you and your business? People who advertise your business and services are a valuable asset to your business growth. Word of Mouth marketing does exactly this! Fellow Pioneer members talk and advertise your business using the information you share and educate them during your Infomercial moment at our Business Referral get together. Our core aim is to Grow Your Business with Valuable Business Referrals by introducing you to more Local Business Professionals! Our Mission is focused on helping our members to cultivate their business through the means of Word-of-Mouth marketing to provide Valuable Business Referrals between members that is full of Passion, Success and Achievement which will result in direct business growth for each member. The Philosophy of GBR4U (Pty) Ltd is built upon the principle of "What You Sow, So Shall You Reap!" The definition of our Philosophy is to keep our Eyes and Ears open for business and passing Valuable Business Referrals on to our fellow GBR4U Pioneer members thereby receiving Valuable Business Referrals in return. This is supported by the Law of Reciprocation. Helping You GROW your business with Valuable Business Referrals! Each Pioneer Group can be compared to a unique Virtual Business Mall. Browse through our Virtual Business Malls and find the exciting goods and services available to you from our various Pioneer Business Members. Remember, Only one of each occupation class may be represented in each Pioneer Virtual Business Mall. This gives our members Exclusivity in each Pioneer Group without worrying about competitors. Please feel free to pop in and visit us, you will be most Welcome! Please complete our Quick Contact Form under the “Contact Us” tab to receive an invitation to one of our Pioneer Business Referral Groups. Should you want to attend a specific Pioneer Group, please indicate it in the “Your Message” section, and please include your primary occupation as well. We will shortly be in contact with you to extend an invitation to attend one of our Business Referral meetings. Yes, I like the business plan but want to visit again before I finally make up my mind. You are most welcome to visit us again. In fact, you may visit any other Pioneer Group within a 35km range as well. You are allowed to have a maximum of 3 visits, collectively, to our business referral meetings. Thereafter you would need to apply for membership. On acceptance you will be Welcomed into your Pioneer Group of choice. Yes, I like the business plan but want to know more, please feel free to chat to our Welcoming Director after our business referral meeting. Yes, I can see the benefit for my business and want to apply for membership immediately before my opposition does. Whatever your decision is, it will be respected. Remember, you may apply for membership immediately or enjoy 3 visits collectively within a 35km radius at any Pioneer Group before making your decision. Once you have applied and accepted as well as welcomed to the Pioneer Group you will be entitled to all Pioneer Privileges, one of which is having Carte Blanch advertising / branding rights within your respective Pioneer Virtual Business Mall. Weekly Attendance Fees will be applicable to visitors and members. Breakfast and Coffee / Tea is included for your enjoyment. The attendance fee is Tax decuctable. Generating Business Referrals for You. Apply for membership to GBR4U (Pty) Ltd today and block out your competitor. Only one business occupation per Pioneer Business Group. No business competition within a specific Pioneer Business Group. Enjoy Carte Blance advertising within a specific Pioneer Business Group. Interacting with other LOCAL business owners / managers. A business may be members of more than one Pioneer Business Group. An individual may only be a member of one specific Pioneer Business Group. Discounted membership rate should your business join more than one GBR4U Pioneer Business Group. Be introduced to people that need your Services or Product. Receive business referrals from fellow GBR4U members. Grow Your Business with 20, 30, 40 or more percent. Attendance at one OSPO is reccomended. WE HELP GROW YOUR BUSINESS WITH VALUABLE BUSINESS REFERRALS! OSPO is an acronym for: Our Success Plan Orientation and are held 3 times per annum. Improve Credibility within your Pioneer Group. Build Trust within your Pioneer Group. More business referrals and increased your Business Profits! Create a Working Team and business referrals. Conduct a Successful Guest Speaker slot. As in Life, there is unfortunately no free lunch. Initial membership fees consist of a once-off Registration Fee plus our Affordable 12 or 24 month period Membership Fee. See our actual membership fees further below. Get To Know fellow Pioneer Group Members. Increase your business exposure with other local business owners or decision makers on a regular basis. You are afforded an opportunity to educate fellow members (Your "Marketing/Sales TEAM") about your business and what type of business referrals you looking for during your Informercial. Encourages you to maintain regular contact with your "Marketing/Sales TEAM" - After all, Out of sight is Out of mind! Build the foundation of Trust within your Pioneer Group. Build the reputation of Credibility within your Pioneer Group. Relationships built upon a shared culture or goal are Trustworthy. Pass and Receive Business Referrals to/from your Group Members. Membership fees are tax deductable. Once Accepted, and Paid, Fee's are Non-Refundable without exception. Membership Committee decision is final. Attendance fees are Tax deductable. Attendance fees may differ from Group to Group. No reason needed to be provided to the applicant on a non-acceptance of an application by the membership committee Pioneer Group or any GBR4U (Pty) Ltd staff including Company Directors.